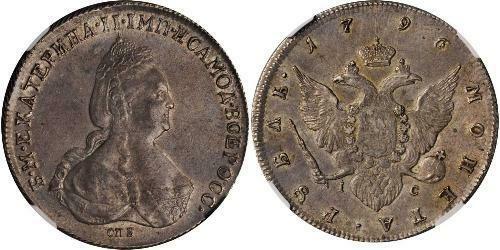 1792, Russia, Empress Cathrine II. Large Silver Rouble Coin. Obverse: Crowned and draped bust of Catherine II right. Mint initials (C.П.Б.) below. Legend: Б.М. ЕКАТЕРИНА . II . IМП . ИСАМОД . ВСЕРОСС . / C.П.Б. 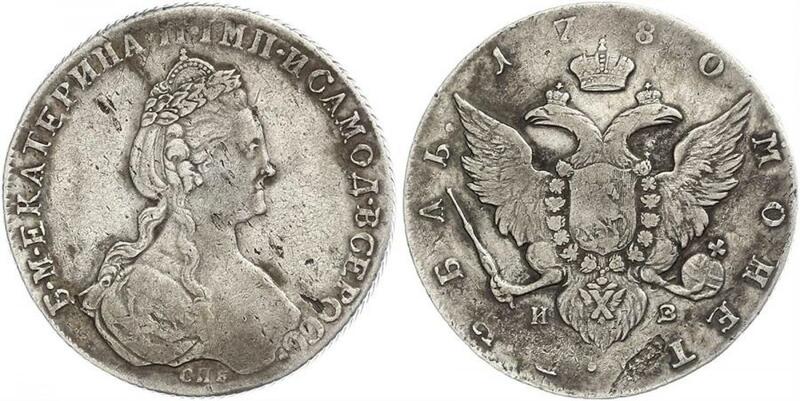 Translated: "Catherine II Empress and Sole-Ruler of all Russia"
Reverse: Large crown above crowned double-headed Russian eagle holding imperial scepter and orb. Comment: Mint master’s initials (Я-А) below eagle’s claws. Legend: МОНЕТА . РУБЛ . 1792 . During her reign Catherine extended the borders of the Russian Empire southward and westward to absorb New Russia, Crimea, Right-Bank Ukraine, Belarus, Lithuania, and Courland at the expense of two powers — the Ottoman Empire and the Polish–Lithuanian Commonwealth. All told, she added some 200,000 miles² (518,000 km²) to Russian territory. Catherine II, called Catherine the Great (Yekaterina II Velikaya; 2 May [O.S. 21 April] 1729 – 17 November [O.S. 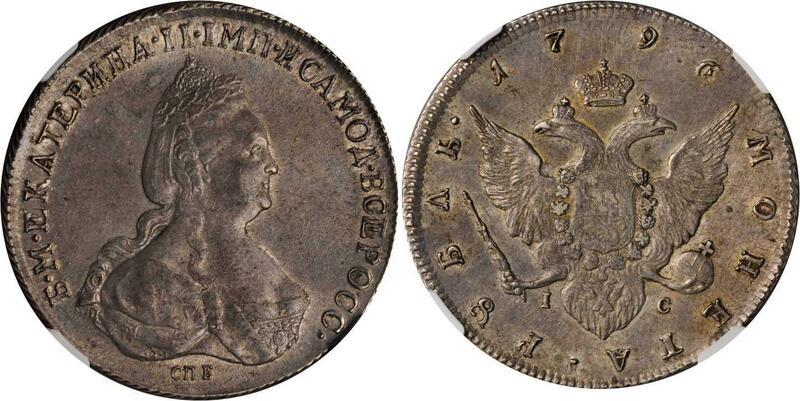 6 November] 1796) reigned as Empress of Russia for 34 years, from 9 July [O.S. 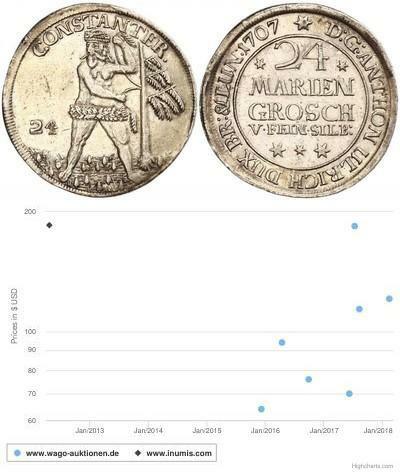 28 June] 1762 until her death. She exemplifies the enlightened despot of her era. Catherine’s father, Christian August, Prince of Anhalt-Zerbst, held the rank of a Prussian general in his capacity as Governor of the city of Stettin (now Szczecin, Poland) in the name of the king of Prussia. 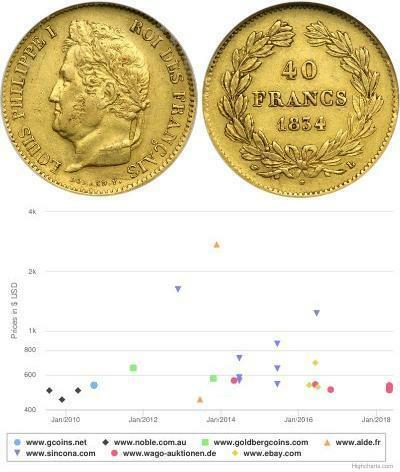 Though born as Sophia Augusta Frederica (Sophia Friederike Auguste von Anhalt-Zerbst, nicknamed “Figchen”), a minor German princess in Stettin, Catherine did have some (very remote) Russian ancestry, and two of her first cousins became Kings of Sweden: Gustav III and Charles XIII. In accordance with the custom then prevailing amongst the German nobility, she received her education chiefly from a French governess and from tutors. The choice of Sophia as wife of the prospective tsar — Peter of Holstein-Gottorp — resulted from some amount of diplomatic management in which Count Lestocq and Frederick II of Prussia took an active part. Lestocq and Frederick wanted to strengthen the friendship between Prussia and Russia in order to weaken the influence of Austria and ruin the chancellor Bestuzhev, on whom Tsarina Elizabeth relied, and who acted as a known partisan of Russo-Austrian co-operation. The diplomatic intrigue failed, largely due to the intervention of Sophie’s mother, Johanna Elisabeth of Holstein-Gottorp, a clever and ambitious woman. Historical accounts portray Catherine’s mother as emotionally cold and physically abusive, as well as a social climber who loved gossip and court intrigues. Johanna’s hunger for fame centered on her daughter’s prospects of becoming empress of Russia, but she infuriated Empress Elizabeth, who eventually banned her from the country for spying for King Frederick of Prussia (reigned 1740–1786). Nonetheless, Elizabeth took a strong liking to the daughter, and the marriage finally took place in 1745. The empress knew the family well because she had intended to marry Princess Johanna’s brother Charles Augustus (Karl August von Holstein), who had died of smallpox in 1727 before the wedding could take place. Princess Sophia spared no effort to ingratiate herself not only with the Empress Elizabeth, but with her husband and with the Russian people. She applied herself to learning the Russian language with such zeal that she rose at night and walked about her bedroom barefoot repeating her lessons(though she mastered the language , she still had her accent). This resulted in a severe attack of pneumonia in March 1744. When she wrote her memoirs she represented herself as having made up her mind when she came to Russia to do whatever seemed necessary, and to profess to believe whatever required of her, in order to become qualified to wear the crown. The consistency of her character throughout life makes it highly probable that even at the age of fifteen she possessed sufficient maturity to adopt this worldly-wise line of conduct. Her father, a very devout Lutheran, strongly opposed his daughter’s conversion. Despite his instructions, on June 28, 1744 the Russian Orthodox Church received her as a member with the name Catherine (Yekaterina or Ekaterina) and the (artificial) patronymic ?????????? (Alekseyevna). On the following day the formal betrothal took place, and Catherine married the Grand Duke Peter on August 21, 1745 at Saint Petersburg. The newlyweds settled in the palace of Oranienbaum, which would remain the residence of the “young court” for 56 years. The unlikely marriage proved unsuccessful — due to the Grand Duke Peter’s impotence and immaturity, he may not have consummated it for 12 years. While Peter took a mistress (Elizabeth Vorontsova), Catherine carried on liaisons with Sergei Saltykov, Charles Hanbury Williams and Stanislaw August Poniatowski. She became friends with Ekaterina Vorontsova-Dashkova, the sister of her husband’s mistress, who introduced her to several powerful political groups that opposed her husband. Catherine read widely and kept up-to-date on current events in Russia and in the rest of Europe. She corresponded with many of the prominent minds of her era, including Voltaire and Diderot. After the death of the Empress Elizabeth on 5 January 1762 [O.S. 25 December 1761], Peter succeeded to the throne as Peter III of Russia and moved into the new Winter Palace in Saint Petersburg; Catherine thus became Empress Consort of Russia. However, the new tsar’s eccentricities and policies, including a great admiration for the Prussian king, Frederick II, alienated the same groups that Catherine had cultivated. Compounding matters, Peter intervened in a dispute between Holstein and Denmark over the province of Schleswig (see Count Johann Hartwig Ernst von Bernstorff). Peter’s insistence on supporting his native Holstein in an unpopular war eroded much of his support among the nobility. In July 1762, Peter committed the political error of retiring with his Holstein-born courtiers and relatives to Oranienbaum, leaving his wife in Saint Petersburg. On July 13 and July 14 the Leib Guard revolted, deposed Peter, and proclaimed Catherine the ruler of Russia. The bloodless coup succeeded; Ekaterina Dashkova, a confidante of Catherine, remarked that Peter seemed rather glad to have rid himself of the throne, and requested only a quiet estate and his mistress. Six months after his accession to the throne and three days after his deposition, on July 17, 1762, Peter III died at Ropsha at the hands of Alexei Orlov (younger brother to Gregory Orlov, then a court favorite and a participant in the coup). Soviet-era historians assumed that Catherine had ordered the murder, as she also disposed of other potential claimants to the throne (Ivan VI and Princess Tarakanova) at about the same time, but many modern historians believe that she had no part in it. Catherine, although not descended from any previous Russian emperor, succeeded her husband, following the precedent established when Catherine I succeeded Peter I in 1725. Her accession-manifesto justified her succession by citing the “unanimous election” of the nation. However a great part of nobility regarded her reign as a usurpation, tolerable only during the minority of her son, Grand Duke Paul. In the 1790s a group of nobles connected with Paul (Nikita Panin and others) contemplated the possibility of a new coup to depose Catherine and transfer the crown to Paul, whose power they envisaged restricting in a kind of constitutional monarchy. However, nothing came of this, and Catherine reigned until her death.